Dayton die springs are made from pre-tempered chrome silicon wire to improve dimensional accuracy, minimize high-stress cracking, optimize the working life of press and mold dies, and help reduce downtime. They are stress relieved after coiling, compressed to solid to enhance fatigue life, and both ends are ground square. The springs are shot-peened to reduce stress and extend service life. Finally, the springs are electro-statically coated with a durable, anti-corrosive vinyl, and color-coded for easy identification. This is the light load series that provides the least force and has the longest travel to solid. The color code is green and there are 107 standard sizes. There is another series of Metric Green Dayton ISO Die Springs. 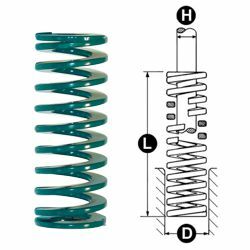 Those are the same as these inch springs. The part numbers are the same with the exception that the inch springs have a "D" prefix added. The available major diameters (D) are 3/8 to 2-1/2 inches. The available length (L) are 1 to 12 inches. Please contact us if you need a different size, or if you need us to make any alterations. SHIPS FROM: Dayton ISO die springs are sent directly to you from a warehouse near Dayton Ohio.